Nothing says Easter quite like succulent roast lamb, this year you can impress your family and friends with a centrepiece that you've prepared yourself from scratch. "Step behind the meat counter" and attend this butchery masterclass to learn a fantastic new skill and see how having confidence in preparing large cuts of meat for yourself at home can really save you money. On this hands on course headed up by David Redman, a butcher with 48 years of experience who works solely with Waitrose, you will learn how to bone out a leg of lamb and master the perfect knot. 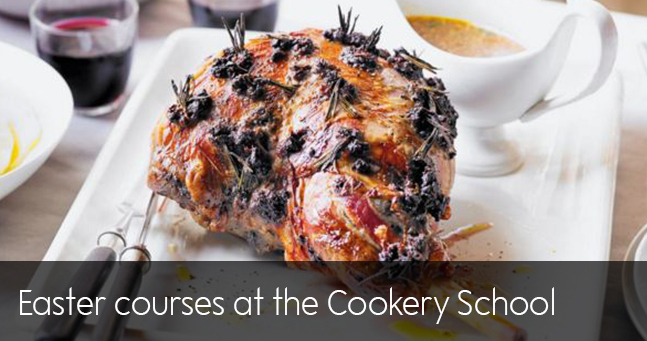 He has teamed up with our Cookery School chefs who will guide you through making a seasonal stuffing for your lamb as well as demonstrating how to cook the joint for you to have a taste. Leave armed with your joint ready for your Easter Sunday roast as well as recipes and inspiration to recreate at home. Do you want to learn all the restaurant secrets on how to cook the perfect roast without spending the whole morning in the kitchen? Let our chefs share their hints and tips on how to plan ahead. You'll be cooking a leg of lamb, cooking the perfect roast potatoes and Yorkshire puddings and of course making a delicious rich meaty gravy with all the sides. You'll be rewarded for your hard work with a glass of wine while enjoying your beautifully cooked roast dinner and to finish you off; you'll be cooking your very own hot cross buns. Mix it, shape it, bake it! Enjoy a day of baking luxurious hot cross buns, a chocolate twist on a traditional Simnel cake, and a Greek Easter classic, Flaounes. At the end of the afternoon you’ll take home all your lovely baked goodies to enjoy with friends and family.